The $50,000 is quite nice as well. Not only do authors look forward to the prize, but so too do booksellers. Following the announcements of the lists and the eventual winner, sales historically increase exponentially. The prize is awarded yearly to the best novel written in the English language. The “longlist,” comprised of thirteen novels, was announced on July 27. That longlist was pared down to a six novels on September 7. The eventual winner will be revealed on October 12. 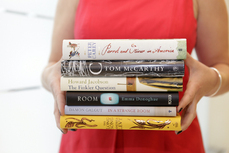 Man Booker also offers Reading Group Guides for all of the books in contention, including the works on the longlist.